Carbon capture and storage (CCS) is a strategy that aims to offset carbon dioxide created from burning fossil fuels by injecting this gas directly into the subsurface. In the case of mineral storage, the injections target certain types of volcanic rocks, so that the carbon dioxide will react with underground minerals to form long-lasting carbonate compounds. The efficiency and hence the long-term viability of mineral storage, however, is still in question. One aspect of CCS that some researchers have overlooked is the role of subsurface microbes. 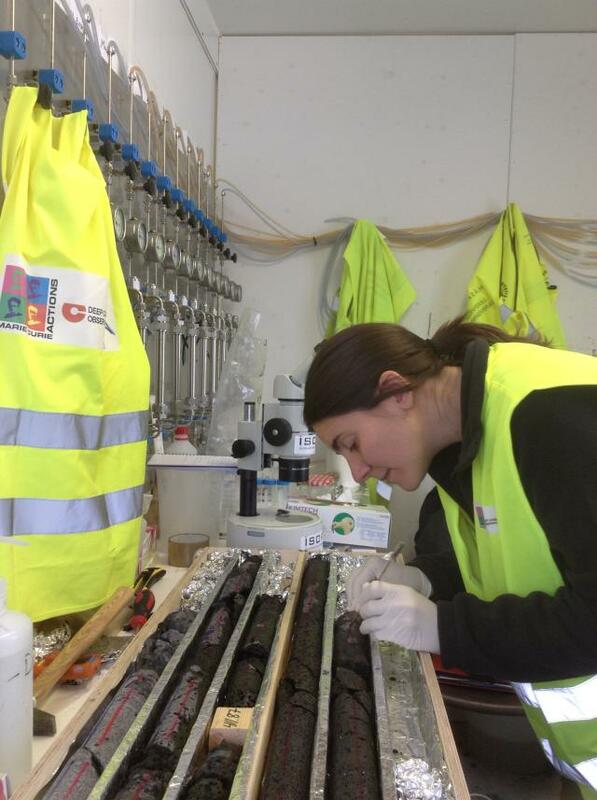 DCO members Rosalia Trias, Bénédicte Ménez, Paul le Campion, Aurélien Lecoeuvre, and Emmanuelle Gérard, (all at the Institut de Physique du Globe de Paris, France), examined how native microbial communities responded to the injection of carbon dioxide into a CCS pilot site adjacent to an Icelandic power plant. In a new paper in Nature Communications , the researchers describe how the injections created successive blooms in certain microbial species. The results suggest that, rather than fully solidifying into carbonate minerals, some of the carbon dioxide became bacterial biomass, which may impact the long-term success of carbon storage. The study benefitted from a larger initiative, CarbFix , an international consortium involving Reykjavik Energy, Columbia University (USA), the University of Southampton (UK), the French CNRS, and researchers at the University of Iceland. This research consortium developed methods for safe, long-term storage of carbon dioxide within basalt, a reactive volcanic rock. To establish proof of concept, they injected carbon dioxide from the Hellisheidi Geothermal Power Plant in southwest Iceland into a well reaching 400 to 800 meters deep. The first injection occurred in January 2012, and by mid-March of that year, due to the acidifying nature of carbon dioxide, the pH of the groundwater had dropped from 9.6 to 6.6. The IPGP group monitored the microbial community in the basalt by sequencing DNA from groundwater samples and detecting key genes for different metabolic processes. They compared their findings to a control well that had not received any carbon dioxide and to the original state of the aquifer prior to injection. The acidic, carbon dioxide-rich water initially caused a decrease in the overall number of microbial species, but certain microbes thrived in these conditions. Iron and other ions, as well as possible polyaromatic hydrocarbons, were leached from the rock, which stimulated certain microbial groups. Bacteria that oxidize iron for energy and can assimilate inorganic carbon, and microbes that use carbon dioxide to degrade aromatic compounds, both experienced blooms. These population explosions suggest that some of the carbon dioxide became incorporated into bacterial biomass rather than, as expected, into stable carbonate minerals. The study also sheds some light on the diversity and activities of microbes inhabiting solid rock environments, which represents a giant but poorly understand habitat. Studies of the microbial communities living in carbon dioxide injection wells may not only guide future CCS efforts, but could also be useful for mimicking another fascinating subsurface habitat: the network of carbon dioxide-rich hydrothermal fluids that circulate within basaltic rocks at mid-ocean ridges.